Julie Waterhouse is a fine art photographer and photography instructor. She resides in Markham, Ontario, Canada, just a short drive from the local farmland and woods she loves to photograph. Her current work is focused on two themes. The first is Ontario farmland. She grew up in a rural area outside Ottawa, and feels very much at home in that environment. She has recently combined this subject matter with her new interest in night photography. The second theme is macro photography of natural subjects, with a special passion for flowers. This reflects the love of details that pervades all aspects of her life. Julie has created a beautiful book that pairs her flower images with inspirational quotes. 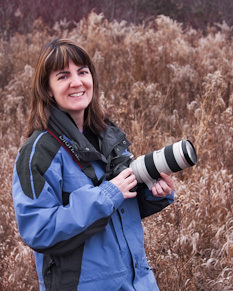 Julie is passionate about teaching photography through classroom and field workshops, as well as one-on-one coaching. Her Ultimate Photo Tips website was born out of a desire to help even more budding photographers worldwide. She has taken photographic courses and workshops from Freeman Patterson, Tony Sweet, Richard Martin, John Paul Caponigro, and Lance Keimig. Julie's photography has won numerous awards, and her prints have been exhibited internationally. Julie was interviewed on the video blog "Smart Creative Women." In the interview, she talks about her business, her transition from the corporate world, and also about creativity. Julie has been a popular speaker at camera clubs across Ontario. In addition, she has spoken at the Canadian Camera Conference (2011 and 2013), Art for All Canada (2012), and was the featured speaker for the RA Photo Club's 2012 Focus Series. In order to focus on her new website development business, Julie is currently taking a break from speaking about photography.